James Chapman was born on 1 April 1810 in Sydney. He was the sixth and last child of emancipatedconvicts William Chapman (c1765-1810, arrived per Pitt in 1792) and Ann Mash or Marsh (c1769-1823, arrived Lady Juliana in 1790). James Chapman’s eldest brother was William Henry Chapman, who built Chapman’s Wharf at Kent Street north in the 1830s (later Jones’ Wharf 1839, then Towns’ Wharf 1844). His eldest sister Ann Eliza (born 1800) was married to Hugh Hector Innes Noble, and also lived at Millers Point. Ann Chapman applied to place her youngest son James in the Male Orphan School in 1818. He left the school in August 1825 and was apprenticed to his brother William at Darling Harbour. When Ann Chapman died in 1823, she left land on the corner of Harrington and Essex streets to her three youngest sons, including James. James Chapman married Esther O’Hara (born c1811) on 8 February 1831. They had 10 children born between 1831 and 1851. James Chapman died on 13 November 1856 and was buried at Camperdown Cemetery in Newtown. His widow Esther Chapman died on 15 May 1863 and was buried at the same cemetery. James Chapman described himself as a shipwright on his marriage certificate in 1831, and it is possible that he and his brother George were working at their brother William’s shipping business at Millers Point. He opened a butchery with his brother-in-law Edward O’Hara Jnr on Princes Street in the early 1830s. Although they dissolved their partnership in 1840, they maintained their family and professional connections. In February 1842, James Chapman bought two lots at 87 and 89 George Street, on the corner of Argyle and George streets. Between 1843 and 1844, he built a house and a butcher’s shop on the site. 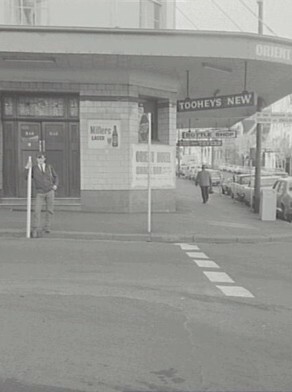 The original shop at 87 George Street seems to have been a single storey structure. By 1845 however, the residence erected by Chapman was described as being constructed of brick with shingle roof, three storeys high with a basement and possessing ‘every convenience’. In February 1843 he was held up by a highwayman with a musket on the Penrith Road, possibly on his way to the Smithfield cattle markets, and was robbed of cash. In January 1844, Chapman was a carcass butcher on George Street with a license for a slaughter house at Black Wattle Swamp. James Chapman was declared insolvent in 1846 but by 1851 was in business again as a shipping and family butcher on George Street north. In 1848 he expanded his property with a brick stable and a wooden shed. By 1849, he had opened the Marine Hotel on the site, the forerunner of the current heritage listed Orient Hotel. The butcher’s shop and the Marine Hotel were operated by Chapman until his death in 1856. His son eldest son James Edward Chapman took over the licence, and in April 1859, the license for the Marine Hotel was conveyed to James Kelly. In November 1842, James Chapman donated 20 shillings towards the erection of a Presbyterian Scots Church. It is likely that his religion was Church of England as per his birth, death and marriage certificates. James Chapman was requested to stand for Gipps Ward by 156 ratepayers and became a foundation councillor from 1 November 1842 to 24 November 1845. Information on James Chapman courtesy Annette Lemercier.